It is emulsifiable pre-emergence selective herbicide. 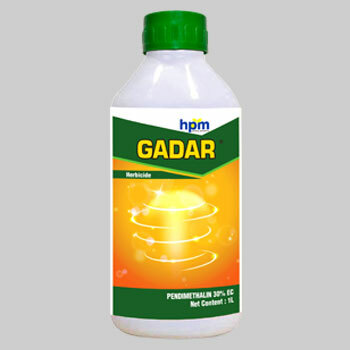 Gadar is very much helpful in controlling the weeds of various crops. It acts by disrupting cell division and cell elongation in shoot and root meristem. The mechanism involves inhibition of microtubule formation in cells which results in inhibition of cell division. In wheat it is applied as pre-emergence i.e. immediately after sowing. It should not be used in the areas where aquaculture / pisciculture is practiced along with rice cultivation.